I read this article and found it very interesting, thought it might be something for you. 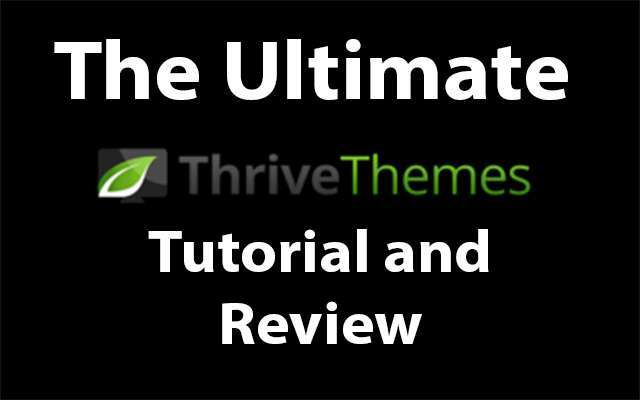 The article is called Ultimate Thrive Themes Tutorial and Review 2018 and is located at http://www.onehourprofessor.com/thrive-themes-tutorial-and-walkthrough/. Well it’s official, I mentioned last week how I was going to redesign the One Hour Professor website and here we are. Did you notice any big changes? You may have, but you have no idea how easy it was for me to get this done. 2) I do not know how to code HTML. The new website design was done with very minimal coding knowledge from myself and nothing more than an awesome resource that I absolutely love called Thrive Themes. Today I’m going to do a full tutorial as well as a review on Thrive Themes to better help you understand what the software is all about and what it’s capable of doing. Full disclosure before we begin, I am an affiliate with Thrive Themes and all of the links within this post are affiliate links. But realize that I’m not pushing this product (or any others) because I’m a dishonest jerk trying to make a quick buck for referring you. Instead, realize that I absolutely LOVE this software and after being asked about it through email around 20 times, I decided it was time to make an amazing tutorial and I think doing it right after my own website redesign makes sense. This post is a culmination of text and YouTube video tutorials, so you may want to bookmark this so you can come back to it later as it’s VERY in-depth (It took me 7 hours to create). Feel free to read this post from top to bottom or use the quick navigation below. What is the Thrive Theme Membership? What I’ve come to realize is that there is a set of essential tools that you absolutely must have in order to create or redesign a website. There are a lot of substitutes out there for each of the tools that I’m going to list, but this is what I use and I’ve had some amazing results. These tools are being recommended because I use them myself and they’re quality products, not because I want to make a few bucks for referring you. WordPress: In my opinion, there is no other CMS platform that measures up to WordPress. There are definitely others out there, but this is completely free and all the tools that I use rely on this platform. Website Hosting: You’re going to need a good hosting platform to house your website. I typically recommend Bluehost to my website visitors and that recommendation still stands. Here’s a 3-Step guide to help you if you don’t have a website/blog yet. I do want to note that I recently migrated over to Siteground because they have some really cool tools that aren’t available on Bluehost and I’ve been blown away by the service so far. I’ll explain more about this in another post, but the GoGeek plan has a 1-button staging website creator and it backs up your website daily automatically which I love! Thrive Themes: By far my favorite product that I’ve ever purchased and the focus of this entire tutorial. This platform isn’t just themes to build your website on, it’s become much more than that and we will examine all aspects of Thrive Themes in this Tutorial. Aweber: There are plenty of other email platforms out there, in fact I even started with Mailchimp, but I’ve come to realize that Aweber does much of what the more expensive guys do and is a fraction of the cost. Not many people realize this, but Aweber recently launched some advanced features and is trying to contend with some of the bigger players in the email industry. You may or may not have heard about Thrive Themes by now, and even if you have, you’re probably not clear on what it it is unless you’re a customer. I kept hearing about Thrive Themes and ignored it until the time came for me to buy software to create lead pages. In doing my research, everyone kept telling me to purchase Lead Pages and I was really considering it until I looked at the cost. At an absolute minimum, you’re looking at paying $300 per year for the Lead Pages standard plan. One thing that I HATE is recurring charges month to month for anything I use, so I kept looking. After doing a ton of research and looking over people’s recommendations, I decided to give Thrive Leads (a Thrive Themes plugin). From there I was up-sold to the Thrive Membership package and the rest is history. So, this company known as “ThriveThemes.com” is much more than just WordPress themes as their name implies. My assumption is that they started off creating themes that were optimized for conversion in WordPress, but they’ve expanded substantially and made some of the most helpful tools that a person like myself (and you!) could ask for. The first thing to know about Thrive Themes is that they are basically a collection of different products offered by the same company. You can think of Thrive Themes as a Toolbox of products that you can use to make your website absolutely awesome. Below is my simple explanation of each of their products that they offer. Thrive Themes: These are easy to use WordPress themes that have a bunch of cool functionality built into them to make your life a lot easier. Need a full width page template for your pages? DONE. Need to make all of your blog posts into excerpts on your homepage? DONE. Need a responsive website? DONE. Want to put a phone number in the top right of your header? DONE. Want to install Google Analytics? DONE. You get the point, but it’s really awesome what they’ve made here. As of now, Thrive Themes consists of 10 different fully customizable themes that you can build your website on top of. Rise theme: An elegant and effective theme for blogging, affiliate marketing and other online businesses. Storied Theme: A interesting layout for bloggers that’s unique and friendly for the eye. Pressive Theme: Impressive and functional design. Streamlined to help you grow your business. Performag Theme: A theme built from the ground up to increase the revenue of magazine and news websites. Voice Theme: A unique blogging theme that puts your content front and center. Optimized for readability. Squared Theme: A fully featured marketing theme with a bold, flat-design style, multimedia post formats and more. Minus Theme: Minimal in design, but packed with features: this is the multi-purpose theme for your next project. Ignition Theme: Ignite your sales with this WordPress theme focused on creating effective marketing pages and blog posts. Luxe Theme: The uncluttered, minimalistic & gorgeously luxurious theme for your WordPress blog. FocusBlog: The perfect theme for creating simple, clean, conversion-focused blogs or business websites. Technically, you could buy any of these themes individually if you wanted, but if you plan on creating multiple websites or really want to grow your own business exponentially, it makes more sense to become a Thrive Member which I’ll explain at the end of the post. How did I use Thrive Themes in my Website Redesign? For the One Hour Professor website, I chose to use the rise theme. I’ll be honest with you, I did this because this looked like it was the closest to what I already had and I know that the theme was easier to customize than the theme I was currently using. So, I simply choose this theme and altered it accordingly with the Thrive Architect. Any of the colors anywhere on the website. Performance issues to speed up your loading times like auto image resizing etc. Social sharing buttons can easily be displayed or not displayed. 404 error page text editor to give users a good experience. And much more than this….but these are the basics. Keep in mind that every one of the themes that they have has these exact same options so it makes a lot of typical development work no longer needed. This in and of itself will save you a ton of money if utilized correctly because these are commonly things that you need a developer to step in and change. Thrive Leads in the next tool that the Thrive company offers. As the name implies, Thrive leads is all about helping you get more leads from your website. This is an extremely well-done plug-in that gives you the ability to quickly and easily create numerous calls to action that encourages your website visitors to sign up for your email list. One of the things that I love about this tool is that it’s really quick and easy to set up and lets you connect with many email providers with very little effort. Thrive Leads itself allows you to create nine different opt-in types of forms. Basically, every single opt-in that I know of can be created with Thrive Leads. They let you do a full-screen takeover as well as a ribbon, lightbox, widget, within the content itself, and more. Beyond the fact that they let you create so many awesome types of opt-ins, they also have a built in A/B testing engine so that you can figure out what the best opt-in is for your website. If used effectively, this feature itself can easily pay for the platform because you could quickly and easily double or even triple your current opt-in rate. In addition to all of this, Thrive Leads also comes with a built in reporting tool that allows you to understand all of the details that you need to know to determine which opt-in forms are performing best. As great as all this is, my favorite thing about Thrive Leads is that by using the platform you are able to easily do what I call “categorical opt-ins”. If you aren’t familiar with the term, let me quickly explain. One of the biggest things about building an email list is offering people content that they REALLY want during or after they read your blog posts. Because of this, most people create one generic opt-in across their entire website and every single blog post has the same offer. As great as this sounds, this actually isn’t the best way to get email subscribers. The best way to get email subscribers is to create an opt in for every single category of your website that people will REALLY want. In an ideal world, you would create an opt in for every single post, but in my mind that just takes too much time and it’s not something that I’m willing to do. All of my income reports have an opt-in for my authority website course, but mention how if somebody loves the income reports then they’ll love my Authority Website course. All of my posts related to website images include an opt-in to my website image database. By doing this, I allow people to join my email list for access to the database and then after they have received access they are sent a second email the day after offering them the authority website mini course. Obviously not everyone joins the course, but is somebody has a brand new website it’s a great offer. These are just two examples, but in an ideal world your create a opt in for every single category of your website. How did I use Thrive Leads in my Website Redesign? For my redesign, I made it so that on every single single blog post you will have three different opt-in forms appear. Every one of these opt-in forms encourage people to get my Authority Website Mini Course. The first occurs ten seconds after a user arrives on the website and is a ribbon that drops down on the top of the screen. The second occurs in the middle of the content as a light blue highlighted box. The third occurs at the end of the post disguised as regular text. I choose not to use categorical opt-ins in my new redesign because I need to go back and look through everything and streamline categories, but I still think everyone should do this because it worked so well for me previously. I try my best to explain the categorical opt-ins in words, but maybe it’s easier to just share the YouTube video that I created which shows you exactly how Thrive Leads works and how I implemented categorical opt-ins. This is probably one of the most important videos you’ll ever watch as I show you exactly what I did to more than double my conversion rate from visitors to email signups. To be completely honest with you, Thrive Architect is by far my favorite tool that the Thrive Themes company has created. The reason is because I’m not someone who fully understands HTML and quite honestly, I have no aspirations to take courses on learning how to code. I’ve always looked for a do-it-yourself tool that had the basic functionality, but also allowed you to do some pretty advanced things and inject manual code whenever needed without coding knowledge. Luckily, Thrive Architect does exactly this. There are honestly so many different things that Thrive Architect allows you to do to design a webpage which would require a developer that it’s kind of mind-boggling. I even took the time to make what I’m calling “The Ultimate Thrive Architect Review and Tutorial” This includes an hour long review and tutorial showing all the functions of the tool as well as a text version of the review as well. Make sure to check it out here. Ready-made buttons to insert into your webpage that can be adjust for color/call to action. The ability to access thousands of icons (like a book icon/telephone/person/etc.) for free and insert them into your website. Pre-built star ratings so that you can create a review and rate it quickly and easily on the page. Building multiple layouts for your pages. Let’s say you want one page at full with a new one another to be two columns, you can do this with a click-and-drag. Responsive video areas and more! How did I use Thrive Architect in my website redesign? I was able to create the current One Hour Professor homepage design all by myself with Thrive Architect and never once had to contact my developer. But that’s not the only page that I redesigned. In fact, if you look at my entire website I redesigned all of the main navigation pages using Thrive Architect and although they are similar to what they used to be, I was able to design all this myself and never once had to retract my developer which was awesome because it saved me the headache of communicating changes and was able to save the money. My above description doesn’t really do Thrive Architect justice. Instead of talking at great lengths about it, you can just watch the video below that shows you how to design a page and gives you plenty examples of the functions within Thrive Architect. I’m sure by now, many of you are familiar with Lead Pages. In terms of landing page software that can help you generate leads quickly, lead pages is the “500 pound gorilla” in the room that nobody seems like they can touch. Well, in my opinion Thrive Landing Pages not only can contest with lead pages, but it actually does an even better job than they do at generating leads when combined with the other Thrive tools. Thrive Landing pages is basically a very simple add on to your WordPress that allows you to simply create and customize pre-built landing pages for exactly what you need. Need a page to do product reviews? Done. Need a page to opt people into a course or product that you created? Done. Need a page to compare two different products and do a comparison review for affiliate marketing? Done. Thrive Landing pages is an awesome plug-in that is very simple to use and allows you to create landing pages with the click of a button. Once a landing page is on the screen, you can simply click on the different elements of the page itself to add the text or change the colors or add any additional elements that you’d like. Truth be told, whatever I say about Thrive Landing pages isn’t nearly as detailed as it needs to be, so it’s probably best that you check out the final tutorial below. The idea behind Thrive Headline Optimizer comes from that fact that you have 2.6 seconds to make users click on content once they arrive. That’s it, 2.6 seconds. No more, no less. Truth be told, that’s not a lot of time and when people come to your website, what do they look at first? Your post and page headlines! Think about how much time you spend writing a post. Now, how much time do you put into writing the headlines of your articles? Not long, and that’s a big mistake. This plugin lets you test headlines on an automated basis. You can test multiple headlines at a time, and the plugin will choose the best performing winner for you and optimize your post appropriately. The key to this plugin is that you need to have decent traffic to your website in order to really see a return on the investment of the content that you create. The statistics and data that the plugin offers is also very robust and lets you see what is getting more clicks and what headlines are really working. This Thrive Headline Optimizer plugin truly lets you “set it and forget it” and that’s awesome when you consider that all you need to do is insert headlines with all of the new content you create and let the website figure out the best performing piece. Thrive Ultimatum is a really great plugin that focuses on the most important thing for a business, increasing conversions. It does this by using scarcity in the form of those fancy countdown timers you see on websites sometimes, but it takes it far beyond that. The truth is, scarcity with works really well. Whether it be a discount, buy one get one, bonus content, or a limited launch, there is a great amount of conversions that can happen when you include an element of scarcity in your campaigns. This plugin works by letting you put widgets on the right side of your blog, or on the top or bottom of the header after someone has triggered the plugin. So, when someone has visited a page on your website, or visited your website for the first time, you can activate the plugin and show a countdown timer for them to purchase a product or service. Further, you can use remarketing on Facebook to drive them back to your website as well once you’ve started the timer. The nice thing too is that you aren’t stuck with just one campaign. You can run multiple campaigns at one time and make it so that people keep getting pushed into different purchasing funnels after converting. When the campaign ends, no problem! The countdown disappears and people will no longer see it. Or, if you are driving people to a page and want to lockdown everything if they miss the deal, no problem. This plugin let’s you redirect to a new page and eliminate the chance of them finding a way in. As great as all of that is, my favorite part of this entire plugin is that you can run an evergreen campaign. In other words, a countdown timer for every single visitor that goes to your website and an automated clock that will follow them from page to page and expire at the right time. But you really won’t get this until you see it in action. Watch the tutorial below and you’ll gain a better understanding of what Thrive Ultimatum is all about. Thrive Ovation is a tool developed to not only encourage customers to leave positive testimonials, but it’s a way to actually automate the entire process so that you spend less time copying and pasting content. Any marketer knows that testimonials from satisfied customers are one of the most important things to include on a sales page. If you aren’t doing this right now, shame on you. If you are doing this, good, but you can do it better. It’s common for people to be “on the fence” about purchasing something. It doesn’t matter if that thing is a service, course, product, or anything else, testimonials matter. For instance, before most people buy anything on Amazon (including myself) what is it that they do? They look at the reviews to see if it’s a good product or not. Your business is no different and Thrive Ovation helps you collect those extremely important reviews/testimonials in a very friendly way. The video below shows you exactly what Thrive Ovation is capable of and it’s something you want to check out if you want to automate this process and save hours of your own valuable time. Picture this. You’re scrolling through Facebook and suddenly you see a friend share their score from a quiz that they just took that rated them as “The Best Star Wars Fan on Earth” because they got 10/10 questions correct. Naturally, as a Star Wars fan you decide to take the quiz itself. You complete the quiz and then share the results. Then your friends do the same thing. Have you ever done this before? I know I have. Even if you aren’t a fan of Star Wars, there’s a good chance that you’ve randomly taken one of these quizzes on social media when you had a few minutes and were curious. Well, now Thrive Quiz Builder makes it possible for you to quickly and easily do that too. In fact, not only can you create the quizzes, but you can use quizzes as a way to grow the size of your email list. This method is incredibly powerful because people like to share their results with their own social network which increases the chance of your quiz going viral. In the video below we examine what Thrive Quiz Builder is all about and how to use it to your advantage. The final part of Thrive Themes is becoming a Thrive Themes member. By becoming a Thrive themes member, you are able to access to every single tool that’s listed above and get unlimited support for as long as you are a member. Truth be told, I personally think that this is the best deal you could possibly take for yourself. $228/year really isn’t that much money and considering this platform will cover nearly all of your web development costs, I think it’s worth it. Becoming a Thrive Themes member allows you to use these tools on all the websites that you own and makes it so that you don’t have to purchase new licenses every time you create a new website. This was a big worry of mine as I am consistently building new websites, but luckily they take care of that. I do want to mention that the price has increased since I originally purchased it myself, and I have a feeling that because this platform is so great it will probably increase again. If you’re on the fence, I highly recommend you purchase now because it may change soon and this way your price point is guaranteed year after year. In closing, I hope that you really enjoyed this tutorial of Thrive Themes. I kept getting asked about it and everyone seemed to be confused, so now I’ve made a much better explanation of how it works and why I keep recommending it to people. Thank you very much for checking this whole thing out, and if you’re interested in becoming a Thrive Themes member (which is what I am and I recommend) just click on the button below. Excellent Ron, truly loved your videos definitely understood the directions you took to explain what Thrive does and how you totally made it simple to understand. Awesome video tutorial. Nice Reviews and tutorials. I agree thrive themes and plugins are awesome. I just signed up for the yearly plan. I was amazed you built your whole site with the plugins and must say it looks great. Very nice design. Did you design it all from blank templates or start with templates? website mini course squeeze page? I absolutely love thrive themes products…they have opened up a whole new world for me and my business. Thanks, really appreciate the kind words! They really are awesome, absolutely love this product. I used the “Rise” theme, but the homepage design was all by myself. A lot of it is just playing with the drag/drop functionality and going from there. My best designed website, by far, is http://www.RehabCenterMarketing.com. That’s easy 🙂 After you insert the opt-in box, there is an option to have it vertical or horizontal. Just switch to your desired layout. I agree on them being awesome. I could very confidently say I’m a web designer with these tools and no one would know the difference, lol. Great feeling, thanks for commenting! How about using these kind of lovely themes with other languages that are written from right to left ? Is the function of drag and drop helpful with changing the position of everything to make it a readable content for languages such as Arabic an Hebrew ? To be honest, that one has never been asked before. However, I don’t see a reason why it wouldn’t work? It’s a simple drag and drop, so it shouldn’t change anything. If you’re on the fence, go for it and if it doesn’t work just ask for a refund. But again, I don’t see why that would be an issue. Thanks , I’m saying this because a lot of times when trying an English font formatted theme with the Arabic language it totally changes the feel and the look of the whole theme and also the other thing is when we place the header and the title and the home menu we need them on the right side which in most of the cases unavailable. Ask sales before you sign up. Apps to be used in arab really has to be redesign as you read everything from the right to the left. Some apps have been developed to work with both layouts but unfortunately such apps are few. Thank you Sunny, I appreciate that!!!! Be warned…it’s a little bit of a pain to setup but they do have detailed instructions and their support is good. You just have to sync it with your accounts once, which is kind of a pain, but after that it’s automated. Thanks, will give it a try. I got another question now. I just bought their ‘content builder plugin’ and was figuring it out. What I’m not sure is that they have the ‘landing page’ plugin which I didn’t know the differences between the two. Should I add the ‘landing page’ or the ‘content builder plugin’ is already enough? If you want pre-made templates, then you should grab the landing page plugin. However, if you are planning on designing everything yourself, it’s fine to just go with what you have. Nice review! Tell me, what kind of page layouts are included in the Rise theme?? I can’t tell from the demo on the Thrive site. Do you see 2 and/or 3 column layouts?? How is it for placing banner ads – vertical and horozontal?? Looking forward to your response. I’m thinking of buying…definitely getting TCB today. You can really create up to 5 columns in any page with TCB. In terms of what is included, most are 2 or 3 columns, but with TCB you don’t really have to worry about that. For placing ads, I recommend using responsive ad units as much as possible with Google Adsense. I’ve had no issues with placing ads, very positive experience so far. hi, im a newbie in these terms. I already created my website from scratch by do-it-yourself style. I am interested in Thrive Themes membership, but if used this package, do I still need a separate autoresponder package? Thanks for asking! Yes, you will need an autoresponder email platform. Thrive Leads can help you with the opt-in forms, but you need an email platform to make the emails get sent. Hi! Thanks for the review. I noticed your sticky widgets, which plugin do you use with your thrive theme to do this? It’s called “Q2W3 Fixed Widget” and you can manage it in the widget section of WordPress. There’s a little button to click to make them fixed position. Even thought I’ve build websites from scratch with free themes I’m struggling with the Pressive theme, I can’t find the options to customize it like I want. For example I want an overlay in the feature image that appear in the head section but when I chose dots it doesn’t work. However in the demo content there in an overlay. Lots of other things I can’t get my head round. I get it, really I do. It can be a little intimidating at first, but the thing I have found most helpful is to just contact their support team in the support forum. They really are amazing and will help you with whatever you need. now i brought thrive themes and used it on my blog ==> https://webhostingdeals.blackfriday/ .. now my blog loads faster.. can you provide any guide to redesign thrive themes into different look. Hi Ron i have a question when you build your thrive lead for the different catorogys are you using the same list from your autoresponder or different lists? Avi – I personally do but you can segment that to different ones if you like. If you use a provider like Convert kit, you can just tag people thought and funnel them to the right places, no need for additional lists. Hello Ron, thanks for this great post. I’m currently trying to decide whether to re engineer my website with Optimize Press (which has a product launch funnel as well as en evergreen funnel module) vrs. The Thrivethemes.com membership, which are great tools, focused on conversion. Which one would you recommend better and why? I can’t really chime in too much here because I’ve never used Optimize Press, but I will say that Thrive is a tool I consider a “must-have” for anyone creating a website. The whole funnel aspect of everything with Thrive can be handled with Thrive Ultimatum. There are some technical hurdles to get it done, but that works just as well I’m sure. You can see above why I recommend Thrive Products and for the cost, I think it is well worth it. They keep updating me weekly with video tutorials on new features and really take the customer feedback seriously. Plus, their support forums are great when you get stuck as well. Thanks a lot for your explanation Ron. I will definitively go for Thrivethemes.com have a great day. I apologize and will try to make it up to you. Hi Ron, thanks for the post, it was great. I have a little question for you about the Rise theme. 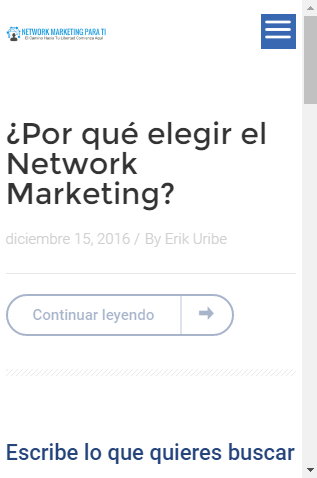 I´m using the same theme in my website, but I have a really big problem and I don´t know how to solve it, and it is about the header logo, you´ll see, when I choose the logo for my website, everything is fine whit the desktop view, but in the tablet or mobile version, the logo turns into a very small image and it doesn´t fit to the header in the mobile devices (tablet or mobile) I left you an image so you can see what I am talking about. I hope you can help me. Thanks again. To be honest, I’m really not too sure how to fix this. However, you can submit a ticket with thrive support and they should be able to handle it quickly and easily. Ok. thank you very much Ron!! I would be wary of using Thrive Themes. I hadn’t used it in months and just had their recurring bill for $75 hit my account. I contacted support and asked to reverse the charge because I don’t use it and just forgot, but they were cold hearted and would not do it. They do not care about keeping a potential return customer happy. It’s a shame. I haven’t experience poor customer service like this in a while. So, be very careful if you’re considering signing up with them! Interesting Elijah, you’re the first complaint I’ve heard re: Thrive Themes. I’m personally fine with the recurring yearly fee because I use the plugin like crazy and I assume that most that buy it probably do as well. However, if you didn’t, I could see that being an issue. Elijahc1: It sounds like thrive themes did their job. In the end no one but “you” can keep up with “you”. Yeah, I’m just not used to a company lately being so cutthroat. I run a couple businesses and wouldn’t bat an eye about refunding a customer in this situation. One charge gained isn’t worth the ill will IMO. And honestly, I most likely would’ve been a return customer. Now never, obviously. I am quick to get a refund or cancel a subscription to software or digital programs I dont like, dont use, etc. However they are not obligated to refund you simply because you haven’t used their product in 3 months. I gotta agree with HFXTrader on this one. It’s not ThriveThemes, it’s you. I agree with you Eli. Quite poor service if they don’t understand the value of staying friends even with customers leaving the ship. Your responsibility. Can you imagine if everyone did this? Do you expect them to go checking to see if you used the plugin? Would a store take clothes back bought months ago? No! So why is it some people think business is any different online. Sorry if I have missed something, but can you tell me what is the easiest way to redo the old post and pages with Thrive? I purchased Thrive membership, and have a website with around 30 posts and want to do them with the Thrive. Sure! you just need Thrive Content Editor and then in WordPress you can choose to use the content builder there. If you have content in the WordPress area for text, you just need to transfer it to the content builder. Thanks for the prompt reply. But I still don’t get it. Do I open to edit the post in the wordpress like before, and then open the new page by clicking the “Edit with Thrive content builder”? But when I do that it opens a new page with the content already on it which cannot be modified. Sorry for asking so much questions! It’s okay Nenad, no worries. You need to take whatever posts/pages you have in WordPress now and copy them to a word document, then delete the content out of your website. From there, open the page with Thrive Content and put the content back in. The reason why content is already there, and non-editable, is because it is on WordPress directly. I wont get any Google penalty for doing this? As long as you do one page at a time, you’ll be fine. Just do the process for one page and then save it and move to the next. Don’t delete all site content and take a week to change format, that would be bad. It clearly looks as though the annual membership is the way to go. As someone COMPLETELY new to this, I have a question-once I have my site up and running using Thrive do I have to continue with the annual fee for as long as the site is active to keep the ‘functions’ live? I have never built a site outside of Wix so forgive me I am lost……. Yes, the cost is annual recurring, but it can be used across many websites. Obviously you can cancel and I believe the elements would still stay in place, but I’m willing to bet that after you get it, you won’t want to cancel. how do you change this part ? where can iI find it in the settings ?